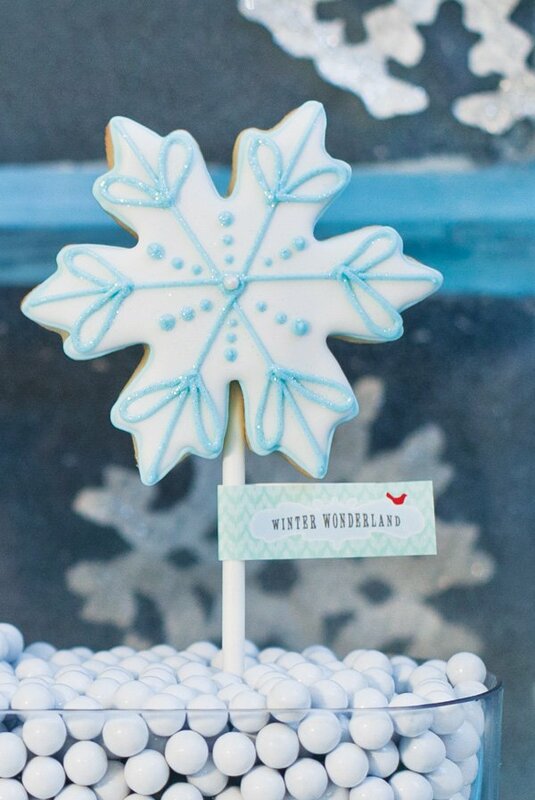 HWTM Contributor Maureen Anders of Anders Ruff here to share our recent whimsical Winter Wonderland Party full of sweet snowy surprises. 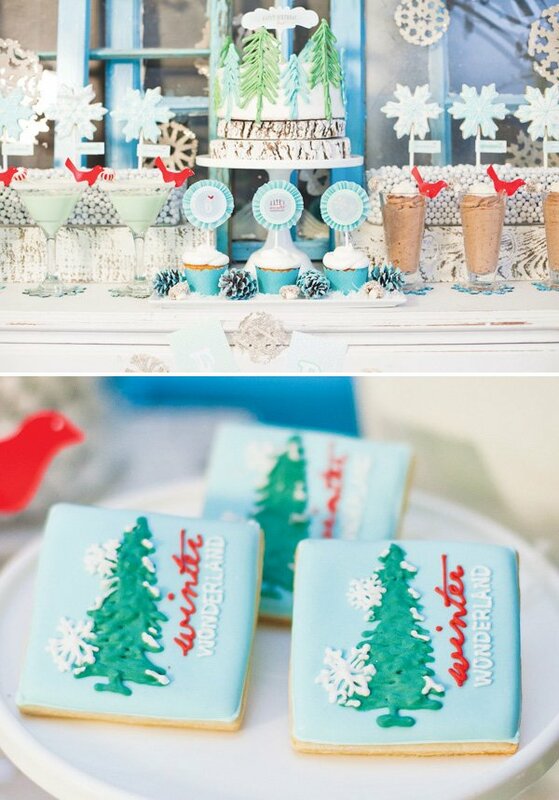 The scene was set with an antique window backdrop that was framed with snowy trees decked out in birds and (edible cookie) snowflakes! 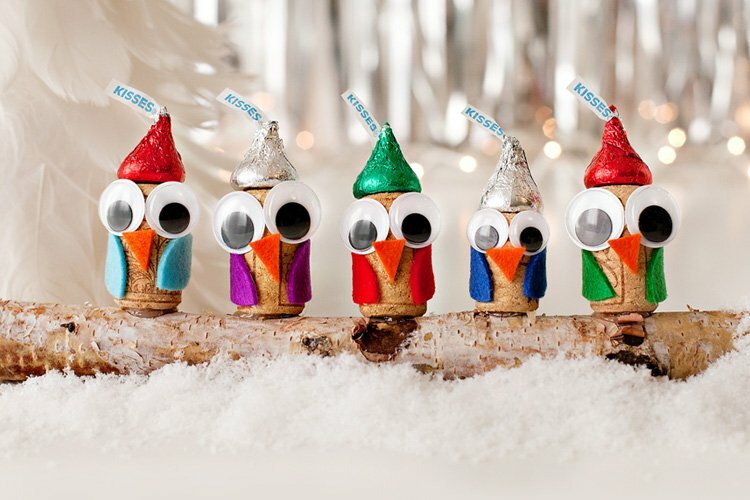 This year, we were inspired to create a versatile winter theme that could be used for both winter birthday parties or holiday parties. 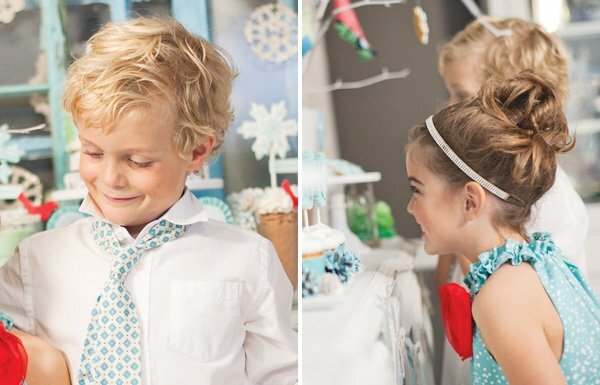 We are excited to introduce a new take on the traditional blue/silver winter party – our recent Winter Wonderland Printable Party Collection with fresh tones of aquas, mint, light blue with pops of red. 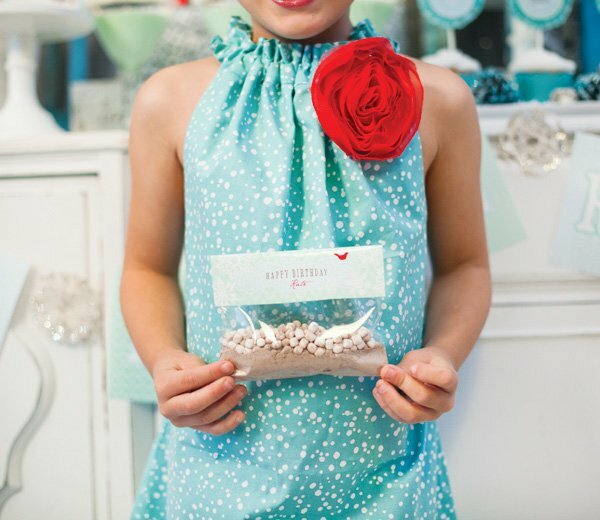 This would be perfect for a holiday party or even as a winter birthday party in January or February. The inspiration for the table came to us while imagining a beautiful wintery day (I grew up in Michigan and Adria grew up in Ohio). We would look out our windows and love to watch the snow fall and get piled up on the window sill. Instantly we knew we had to use antique windows as the backdrop. We found these at an antique shop for under $10 and spray painted them blue and aqua tones from our collection. We took fallen tree branches and painted them with a high gloss white spray paint and potted them in white pots. These were used as anchors for the sides of the table. Painted metal address numbers were painted and hung from the front of each tree pot. The little girl was turning 6, so this was a way to add her age into the decor. We hand sewed birds to hang from these branches. 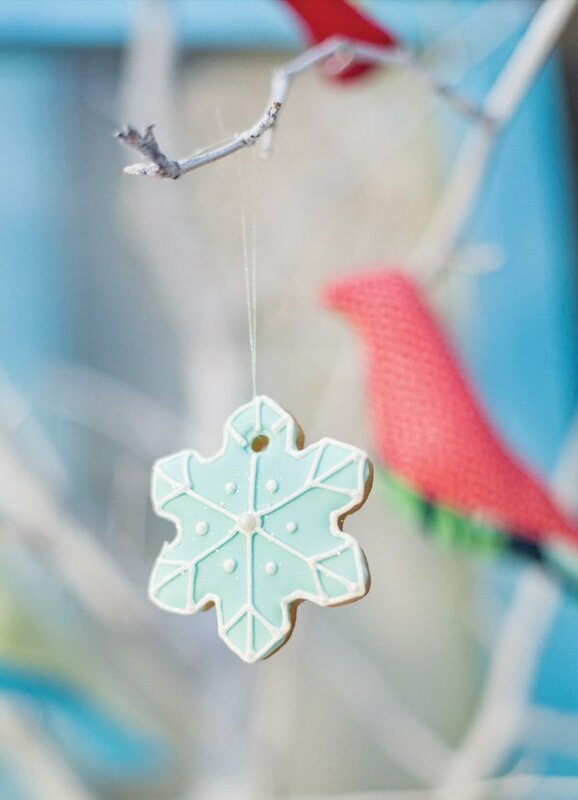 We also hung small snowflake sugar cookies (from Firefly Confections) from the branches as well. Whitewashed 4×4 logs were used to add height to the back of the table. We also used whitewashed slices of logs to prop up the vases holding the tree branches. 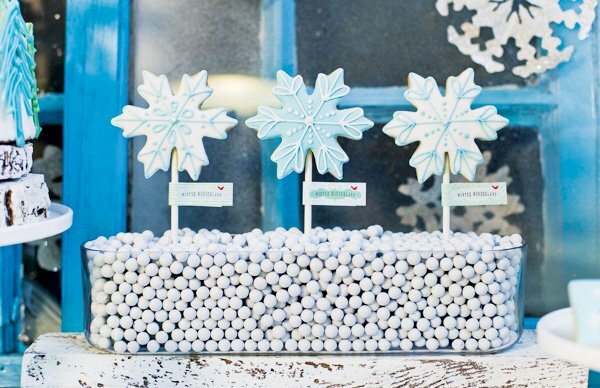 To make the scene a little more rustic, we used old book pages to create hand cut snowflakes of various sizes. German Glass glitter was used to add sparkle around the edges and the centers of each snowflake and really made the snowflakes sparkle. These were placed on the banner, as well as on the window backdrop. 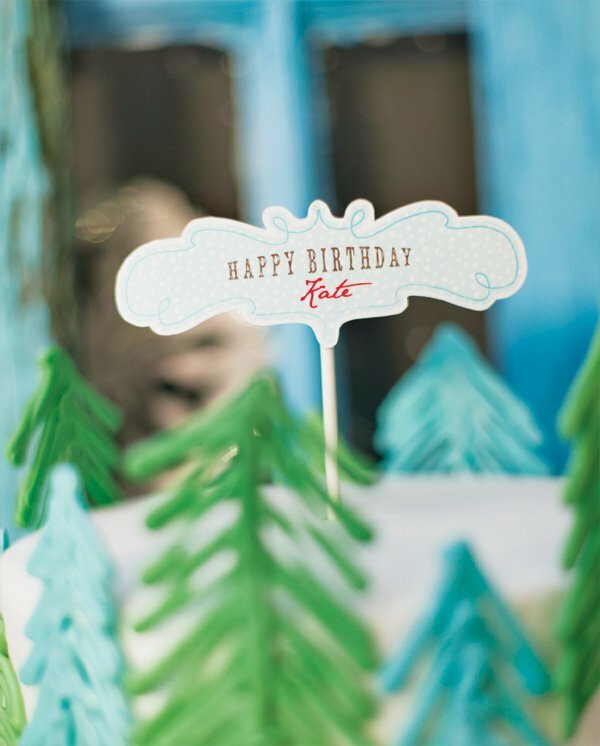 The Winter Wonderland Printables were used throughout the scene. 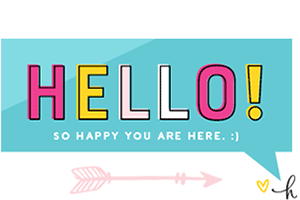 We printed on both photo paper and glossy label paper from Onlinelabels.com. We love snow globes and so we created a unique edible favor that was a stacked meringue tree snow globe. We stacked 3 meringues together (ombre shades of green and mint) and used white chocolate to stick them together. We placed them in an upside down mason jar with a dusting of powdered sugar and sat them on top a bed of shredded coconut. 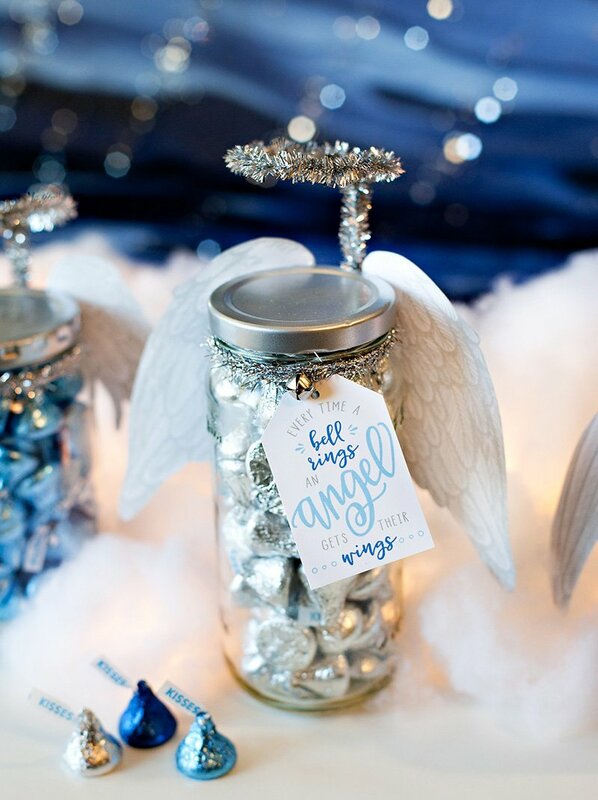 The jars were embellished with a printable bird silhouette. 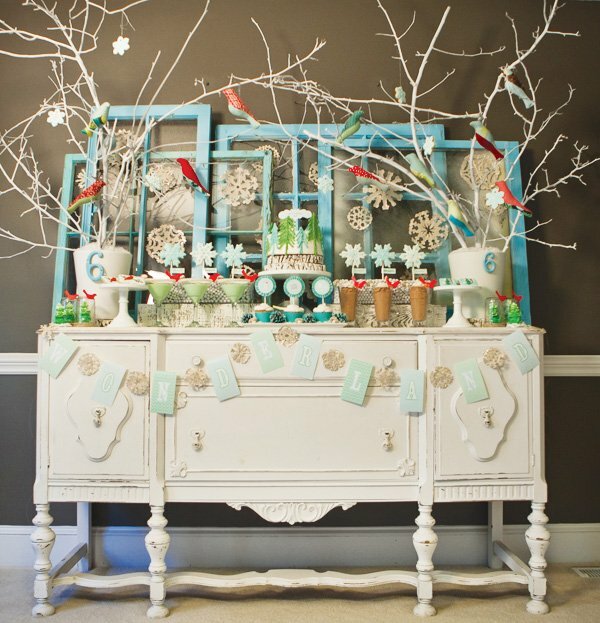 The table also held long vessels filled with white sixlets and snowflake cookie pops that were embellished with a printable party flag. 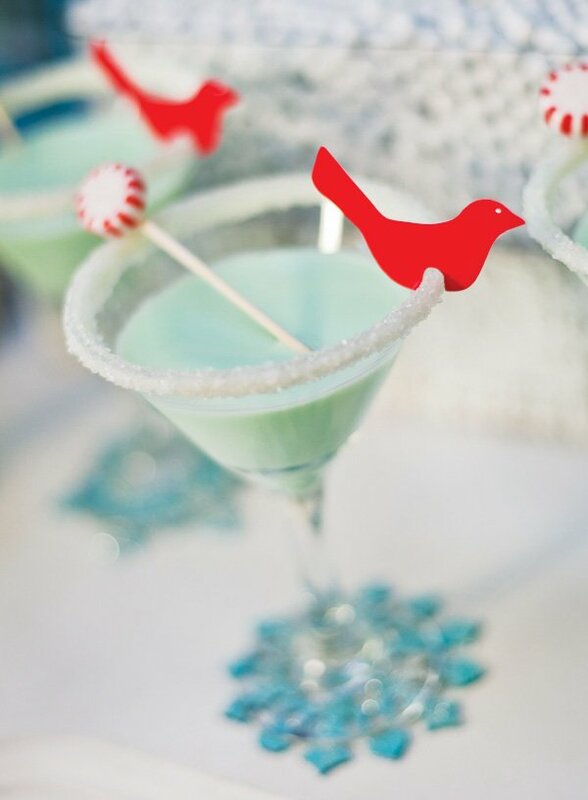 Mint chocolate martinis (non-alcoholic for the kiddos) were displayed with a peppermint swizzle stick and printable bird silhouette on the rim. The rim was first dipped in white chocolate and then dipped in sanding sugar to look like snow or ice. These sat on a glittered aqua snowflake coaster made from a wooden ornament. 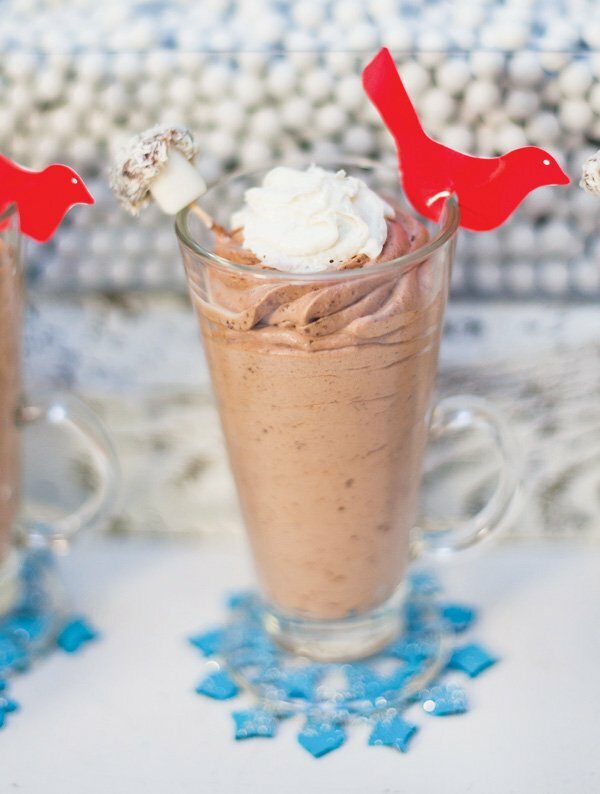 Instead of hot cocoa, we made chocolate mousse and displayed those in glass mugs with the red silhouette bird embellishment. A little woodland mushroom candy was placed on the edge with a toothpick. 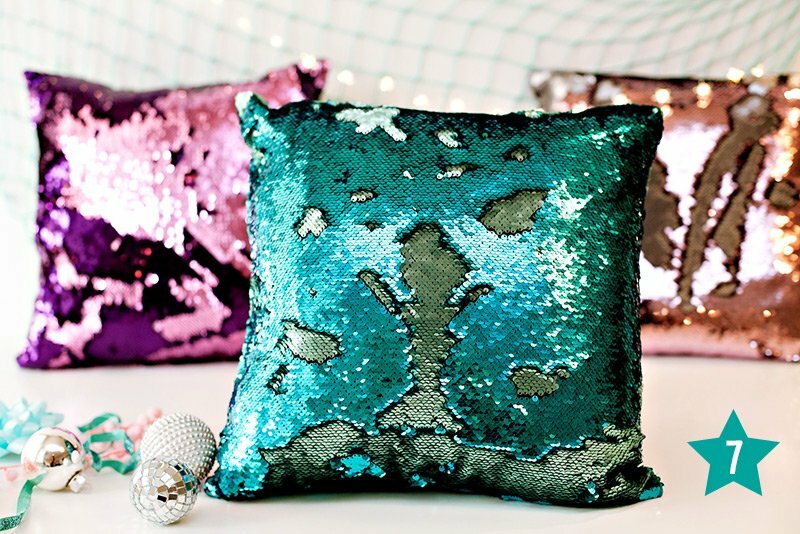 These also sat on a glittered aqua snowflake coaster made from a wooden ornament. Cupcakes were displayed on a serving platter lined with coconut and painted pine cones. 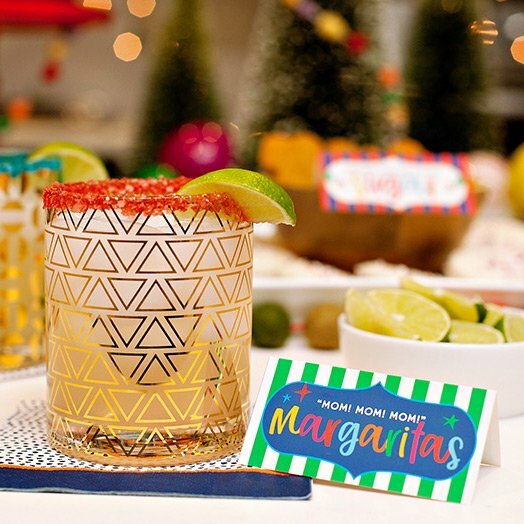 We topped them with ruffle matted printable party logos from our Winter Wonderland Collection. 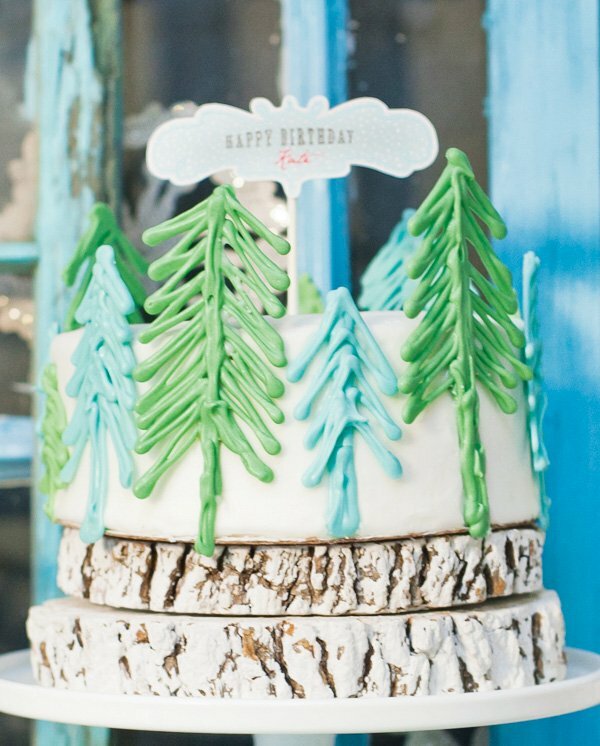 The cake was a $10 white cake from Target and we embellished it with a printable “Winter Wonderland” topper and chocolate drawn trees. We saw this done on Pinterest with chocolate and did our own version with colored chocolates to match the aqua and mint tones. A printable “Wonderland” Banner from our collection hung from the front of the buffet and included german glass glittered book page snowflakes. The book page snowflakes also embellished the antique windows that were stacked as the backdrop. 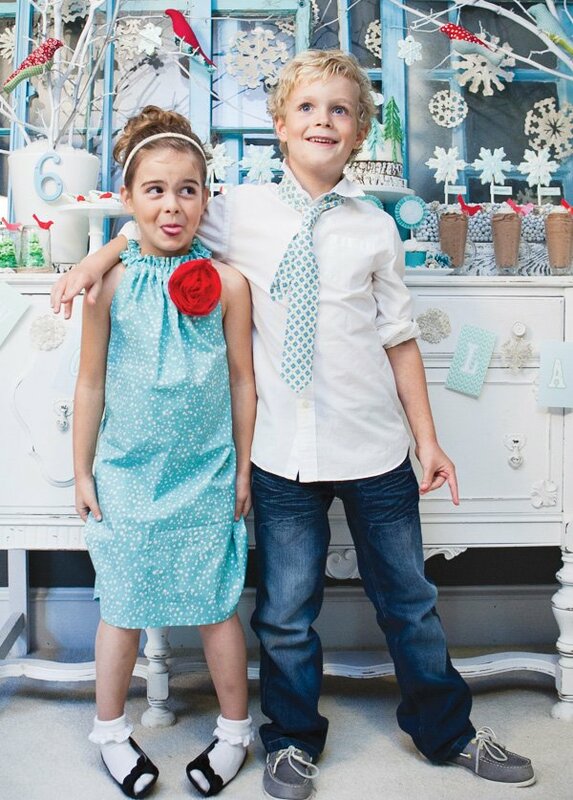 Best of all, Adria’s daughter and my son were able to be part of the shoot. They had so much fun! B Belle Couture provided the precious dress and tie. The hair accessory was from Drop of Honey Bowtique. 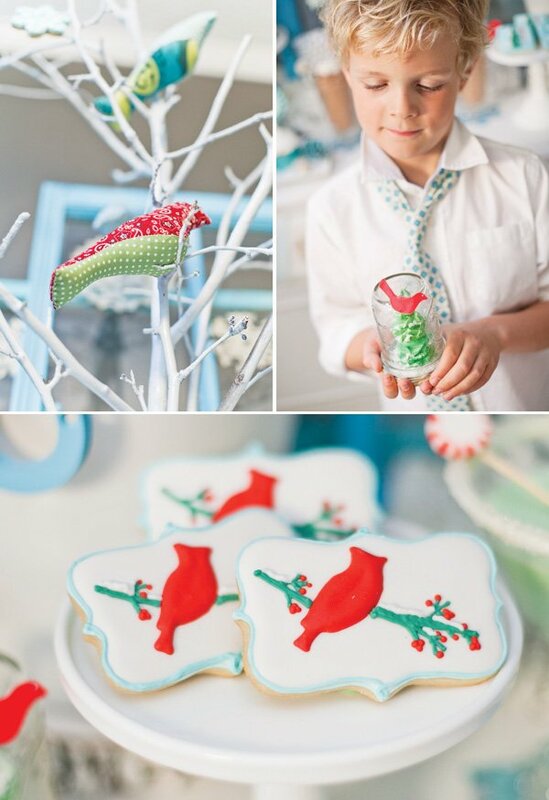 The “Winter Wonderland” Printable Collection and invitation is available in the Anders Ruff shop. Precious! So many fabulous details! I love the use of antique windows (one of my favorite props, too! )–and especially painted turquoise. The red bird motif carried through so many elements. 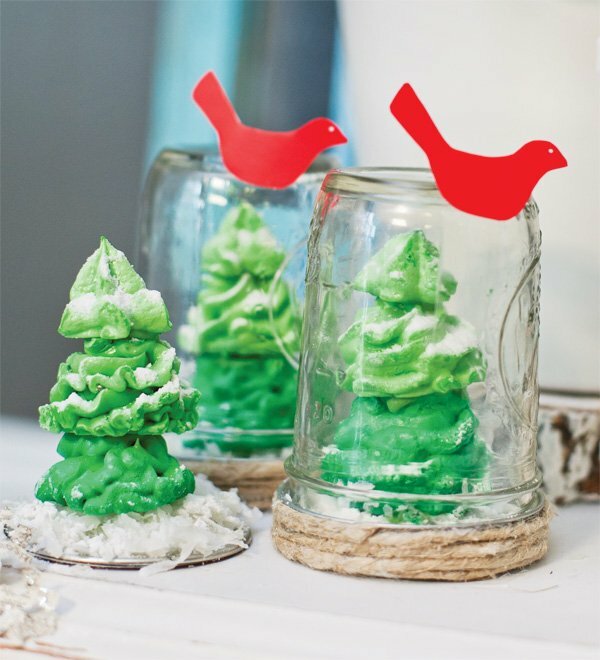 Those adorable meringue tree snowglobe favors! The white snowy texture on the rough slices of logs! Swoon. Awesome! 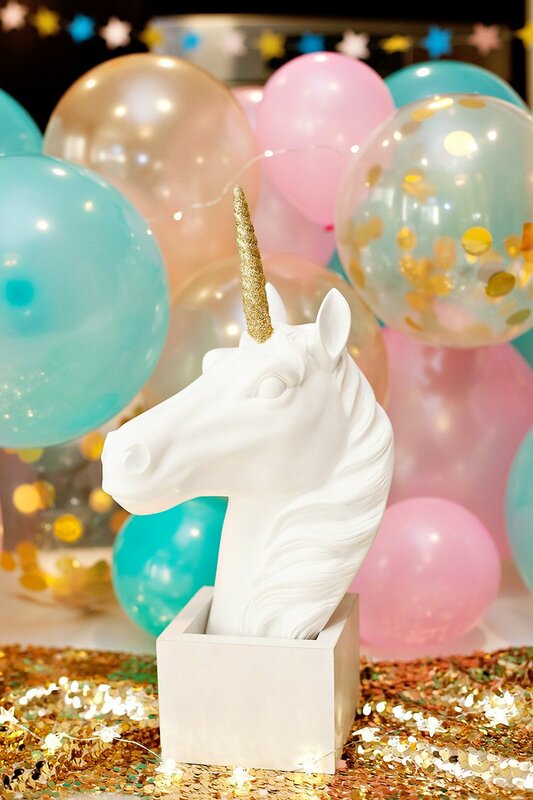 I love the colours and the whimsical feel of the party! Fabulous how every detail works together for a ‘wintry-minty’ look! So pretty! Love, love, love everything about this! My new favorite! Great job, ladies! BEAUTIFUL! Love it all so much! The windows make the perfect backdrop!